The proponents of state-contingent debt instruments (SCDIs) – including Krugman (1988), Shiller (1993), Borenszstein and Mauro (2004), Summers (2015), and Blanchard et al. (2016) – have made a strong case for these instruments over recent decades. GDP-linked bonds, which link the repayment obligations of a sovereign to economic growth, can stabilise the debt-to-GDP ratio and generate policy space during recessions, which can be used to support the recovery. Furthermore, insofar as the debt stabilisation benefits of such instruments reduce the probability of sovereign debt crises, the default risk premium on all of the sovereign’s debt would fall. The benefits of SCDIs will be greater for countries where public debt and the variance of the interest rate-growth differential are high, or where gross financing needs can rise above safe levels in the event of large one-off shocks. 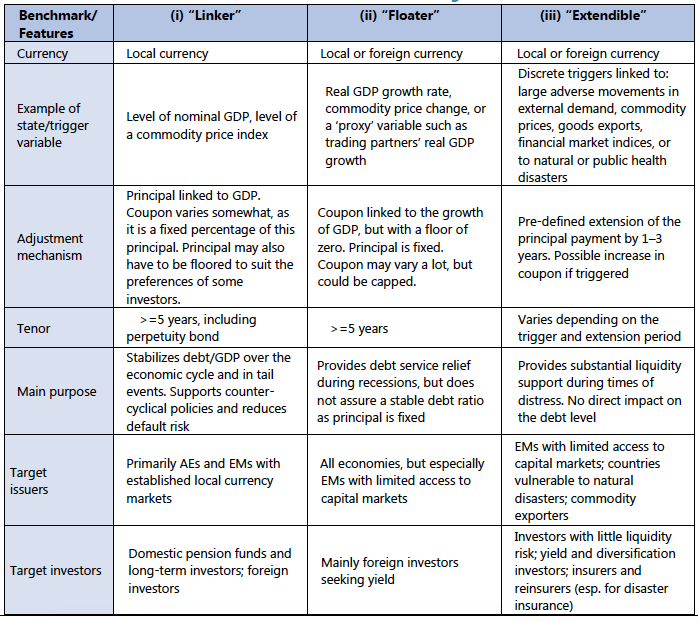 Table 1 gives an overview of various country groups and how these considerations play out. Recent research has further illustrated the potential scale of these benefits. Pienkowski (2017a) shows that if just one fifth of a typical advanced economy’s debt is GDP-linked, its ‘debt limit’ could increase by around 15% of GDP (enough to accommodate the average fiscal costs of a systemic banking crisis). Extendible bonds, where the maturity date is stretched in the event of a pre-defined shock – such as a hurricane, or a drop in commodity prices – can provide significant liquidity relief in times of crisis. Although countries have access to other tools to preserve policy space, they may not be entirely adequate. For instance, long-term local currency debt can guard against refinancing but not solvency risks, while commodity hedges may not be available in long-enough tenors. It is not surprising, therefore, that the G20 has taken a keen interest in this issue in recent months (G20 2017). promote more accurate pricing of sovereign risk – SCDIs involve variable nominal return variability, they strengthen incentives for investors to look more closely at the macroeconomic outlook and the sovereign’s fundamentals more broadly. While the theoretical benefits are clear, critics point out that these stylised models fail to capture many of the practical complications and constraints associated with these instruments. In response, the IMF has recently published a comprehensive study of SCDIs (IMF 2017). It provides a detailed history of the use of SCDIs, both during restructurings and in ‘normal times’ (this is summarised in companion VoxEU column; see Anthony et al. 2017). This analysis is married with detailed investor and issuer outreach to understand the constraints and concerns of those who would potentially buy and sell these instruments. At least initially, these instruments could face substantial novelty, liquidity, and model risk premia. ‘First-movers’ could be discouraged even if a deep and liquid market could eventually emerge. Another first-mover problem – adverse selection – could also be a constraint if those issuing SCDIs are viewed with a stigma that they are hiding weak fundamentals. This could create a first-mover bottleneck that could be overcome only if a group of sovereigns issue together, or a very safe sovereign goes first. Significant issuance could lead to a reduction in the supply of ‘safe’ conventional assets, which are important for financial market transactions. Similarly, they could transfer excessive risk to the private sector, causing business or financial cycles to become more volatile and worsening sovereign-bank nexus. However, this concern is lessened insofar as SCDIs are held by foreign investors. Like all insurance products, they could increase the risk of moral hazard (especially if the sovereign is left with less ‘skin in the game’) or the incentives for issuers to manipulate data in their favour. Given these challenges and constraints, it is likely that for some sovereigns, the costs of SCDIs would outweigh the benefits. For countries where there are strong prospects, given the challenges a reasonable approach could be to pursue SCDI issuance in an incremental manner – perhaps starting in good times – carefully integrating them into debt markets and sovereign portfolios, and with initial designs including limits on upside and downside risk-sharing. However, even an incremental approach must involve a commitment to issue regularly and in sufficient volume to cover investors’ start-up costs. Even then, patient outreach to a range of investors will be needed. Careful instrument design has the potential to mitigate some of the complications noted above. Building on papers such as Benford et al. (2016) and Brooke et al. 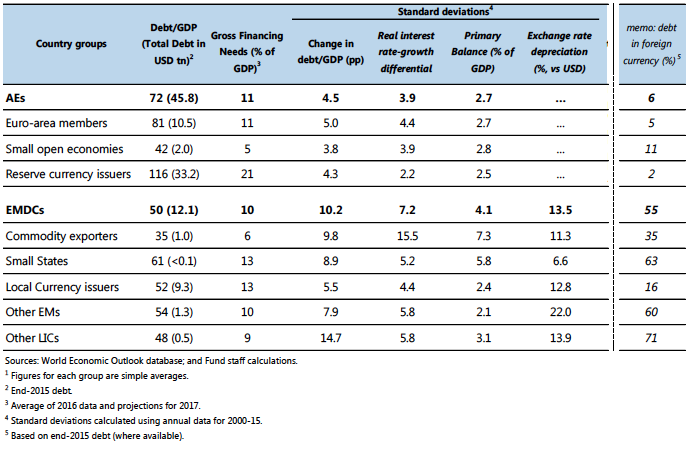 (2013), which focus on the design of individual SCDIs, IMF (2017) proposes three benchmark designs that can balance the needs of specific countries and investors with the desire to have a few commonly understood designs that can support market depth (see Table 2). In the first design, a linker design, akin to inflation-linked bonds both the coupon and the principal are directly linked to the level of the state variable. An obvious example of this design is a local currency nominal GDP-linked bond. The second design is a floater, in which there is a fixed principal, with a coupon linked to change in state variable. In Borensztein and Mauro’s (2004) design of a growth-indexed bond, the coupon is tied to real GDP growth. On technical grounds, a coupon floor of at least zero would likely be needed, but the floor could be set higher, depending on the context. The final benchmark design is extendible – a maturity extension linked to a pre-defined trigger. The main feature of the extendible is that it postpones the maturity of a bond when a pre-defined trigger is breached, but maintains principal and possibly coupon payments unchanged. The impact of these instruments on sovereign debt dynamics will depend on several factors, including their share in the debt stock, the economic fundamentals of the sovereign, and the size of potential shocks. To model these effects, the IMF has developed a set of excel-based ‘calculators’ that potential issuers and market participants can use to simulate the effect on debt and gross financing needs (these will be explored in another column). It is also clear that robust institutions are needed to ensure confidence in SCDIs. For example, independent statistical agencies are indispensable in attenuating concerns around data integrity and payouts. Contracts must also be clear and predictable. The Bank of England, in collaboration with legal and financial market practitioners, has developed a ‘London termsheet’ for GDP-linked bonds (ICMA 2016) which seeks to address specific investor concerns. In addition, where data manipulation concerns are high, it may be possible to use exogenous proxy variables to mimic many of the benefits of more standard SCDIs – for example, using trading partner GDP or export data as a proxy for GDP. The near future will likely be characterised by continued sporadic tailored issuance of SCDIs in four key areas. They are likely to be used in countries vulnerable to large exogenous shocks such as commodity producers and small states. These have concentrated exposures to shocks that are exogenous and can be translated into a state variable outside government control. Another relevant area is countries normally reliant on concessional official finance. These countries could ask official creditors to incorporate state-contingent features (such as countercyclical grace periods tied to exports) in more of their lending (for more details, including AFD’s countercyclical facilities, see Zoheir and Tavakoli 2016). Third, SCDIs could be used in situations where they can meet the hedging needs of a specific domestic investors. Examples of this would be pension funds, retail investors, or Islamic finance investors. Finally, SCDIs have potential in countries undertaking debt restructurings. The likelihood of successfully negotiating state-contingent instruments is higher in such contexts, given the typical divergence of views between the sovereign and the creditor over the state of the economy, and because stigma issues are less of a concern. Given the potential positive, system-wide externalities associated with SCDIs, official sector support for broader market development may also be warranted over the medium term. For instance, the official sector can partner with the private sector to assist market participants in the development of commonly agreed model contracts for the three benchmark designs (building on the example of the London termsheet). This can mitigate start-up costs of designing a commonly recognised contractual framework, and constitute a helpful resource, including for tailored issuances, such as in a restructuring context. More ambitious support would involve leveraging official sector balance sheets. For instance, multilateral development banks could consider underwriting/guaranteeing SCDI transactions where countries cannot afford such instruments on their own, despite recognising the significant benefits associated with them. Or, on the issuer side, a safe sovereign, or regional institution, or group of sovereigns could jump-start the market (as proposed by Makoff 2017). This is likely to command greater investor confidence and be associated with lower issuance premiums – and, if the market that emerges is sufficiently deep, could also help set a benchmark for pricing, rating, and regulatory treatment. Authors’ note: This column draws on the main findings of a recent IMF board paper on “State-contingent debt instruments for sovereigns” (IMF 2017). The views expressed in this article are those of the authors and should not be attributed to the IMF, its Executive Board, or its management. Any errors and omissions are the sole responsibility of the authors. Anthony, M L, N Balta, T Best, S Nadeem and E Togo (2017), "What history tells us about state-contingent debt instruments", VoxEU.org, 6 June. Benford, J, T Best, and M Joy (2016), “Sovereign GDP-Linked Bonds”, (with contributions from other central banks), Bank of England Financial Stability Paper no. 39. Blanchard, O, P Mauro, and J Acalin (2016), “The Case for Growth Indexed Bonds in Advanced Economies Today”, Peterson Institute for International Economics, Policy Brief no. 16–2. Borensztein, E, and P Mauro (2004), “The Case for GDP-Indexed Bonds,” Economic Policy 38: 166–216. Brooke, M, R Mendes, A Pienkowski, and E Santor (2013), “Sovereign Default and State-Contingent Debt”, Bank of England Financial Stability Paper no. 27. ICMA (2016), “Sovereign Debt Information”. International Monetary Fund (2017), “State-Contingent Debt Instruments for Sovereigns”, IMF Policy Paper, May 22, Washington. G20 (2017), “Compass for GDP-Linked Bonds”. Krugman, P (1988), “Financing vs Forgiving a Debt Overhang,” NBER Working Paper No. 2486. Makoff, G (2017), “GDP-indexed Bonds: A Way Forward”, Centre for International Governance Innovation Policy Briefing No. 97. Pienkowski, A (2017a), “Debt Limits and the Structure of Sovereign Debt,” IMF Working Paper WP/17/117. Shiller, R (1993), Macro Markets: Creating Institutions for Managing Society’s Largest Economic Risks, Oxford University Press. Summers, L (2015), “Pandemic Bonds have Potential to be Win-win-win”, Financial Times. Swiss Re (2017), “Growth Recipes: The Need to Strengthen Private Capital Markets”, December. Zoheir, E, and H Tavakoli, (2016), “Countercyclical Financial Instruments—Building Fiscal Resilience to Exogenous Shocks”, The Commonwealth Secretariat.